note to self: make sure pauline is not near me @ all this summer. Colin dressed as a bumble bee has made my day. How is a cardboard box so cute?!! Is it true? Pauline is helping for once? I dont believe it. And not once did she actually make fun of Colin. I dont think thats the real Pauline, probibly one of her nicer sisters who escaped the paper-chain. Awe!!!!!! Cuteeee!! 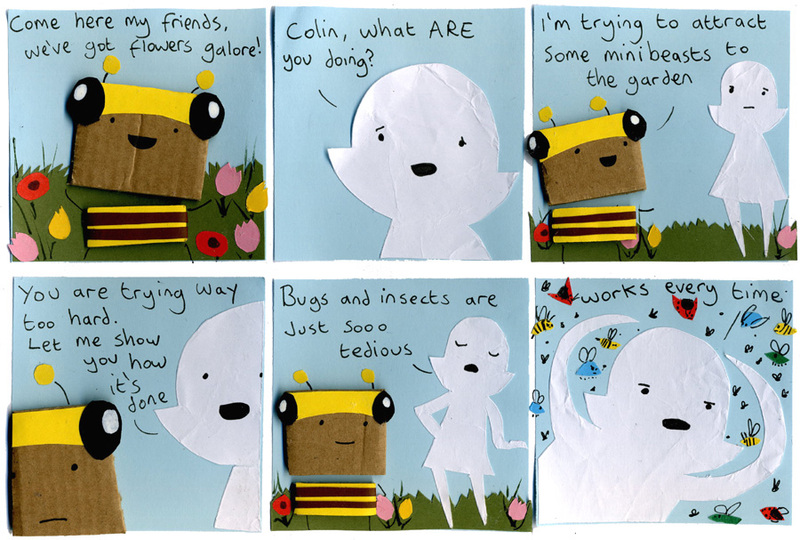 I like Bumble Bee Colin. He’s way too cute in the bee suit!! Thanx for sharing the cardboard life, Philippa, it’s just wonderful! Wow, I’m surprised; pauline’s annoyingness can be put to good use! Note to self: use “mini beasts” instead of bugs. I will now refuse to call bugs by any other name besides mini beasts! What can I say? Colin looks adorable with this costume!!!! And Pauline is right… always works! And great job on getting those bugs Pauline! !